One of the reasons I am not doing much grocery shopping is because Hubby and I again bought half a cow. We bought half a cow specifically so we wouldn’t have to worry about the price of meat rising, so that we would be able to pick and choose what cuts we wanted, and so that we “knew” what type of meat we were getting – all natural, raised free of growth hormones and antibiotics. We purchased our half a cow from Hanova Hills Farm, producer of “Lake Country Premium Natural Beef”. Hubby found them last year either in his travels, or from a recommendation. I never did get the full story on that. We put in an order last fall. We were told our beef would be ready in either November, or in January. 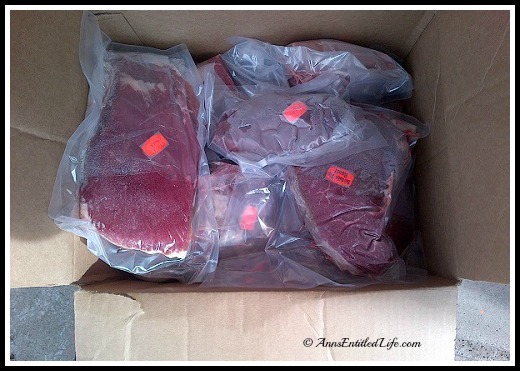 Well, when the beef wasn’t available in November, Hubby called and told them we couldn’t take delivery until March as we were vacationing in Florida. They were fine with this development and the last week of February they called Hubby to see how we would like the meat butchered. When you order a pig, cow, lamb, etc, you decide what cuts of meat you would like – roasts, steaks, chops, crown roasts, ground meats, etc. It is very specific, and you tailor to your family needs. Don’t worry, you don’t have to know all the different cuts, your local farmer will walk you though the choices. If you are interested in learning, I actually bought Hubby the The Meat Buyers Guide : Meat, Lamb, Veal, Pork and Poultry for a gift last year. It is definitely comprehensive! We chose a lot of roasts, ground beef, and hubby asked for the bones (from which he made a FABULOUS low-sodium beef stock) as well as the organs. In all we paid for just over 300 pounds of meat at $3.90 a pound. When we opened the boxes to unload into the garage chest freezer, we saw that the meat was foodsavered. You cannot imagine how thrilled hubby was to have everything not only labeled, but ready for long term freezing. And as an added bonus – and something we didn’t see until we defrosted a roast to cook – was that this was double-bagged for extra freshness! Hubby was super impressed. To date we have had ground beef and chuck roast. While both suited our taste, we once again found that the meat is very, very lean. The chuck roast was far less marbled than what I buy in the grocery store, and the ground beef was probably 90/10, possibly 93/7. Our future recipes will have to take into account the leanness of the meat, and the lack of fat. 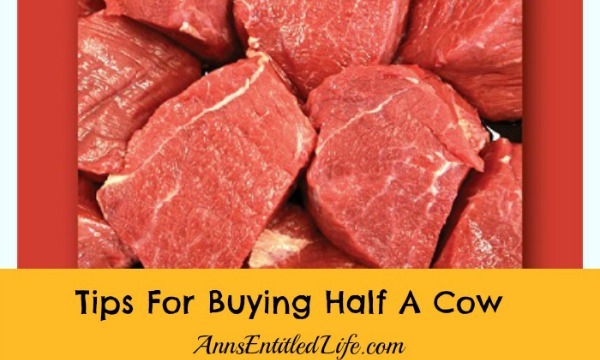 This was our second time buying half a cow (we buy a pig a lot more often), and we will continue to do so. It is worth it to us not only for the stockpile aspect, but for the peace of mind of knowing what the animal was fed, and how it was raised. If you are interested in buying your meat directly from a farmer, localharvest.org is a great place to start your search. Have you ever purchased meat directly from the farmer? How did that turn out for you? • For Library Topics on Ann’s Entitled Life, click here. We finally had our cow butchered this Jan/Feb. We had a Amish Friend raise it and we had to send it out to our local butcher, we got a whole cow. I am so thrilled to have done this. The hamburger is awesome, not slimy…. like the markets where I could scrape the slime (fat) off my hands after making hamburgers. The taste is different too. I would be interested to hear, how you are going to use the organs. Ida when hubby finally uses the organs, I will be sure to let you know what he does with them. Previously I didn’t buy much other than ground beef because of the cost. After reading about how most grocery store beef is produced, we decided to look for a local source. I found one less than five miles from my home! We ordered beef for the first time last year. Love it. It came foodsavered. I learned some new cooking techniques as I dealt with cuts I’d never heard of before. We’ve been eating great-tasting beef, I didn’t have to look for whatever meat is on sale this week, and we’re support a neighbor. My supply is dangerously low now, so I’ve got my fingers crossed that another delivery is ready soon. Julie we did the same thing with out first cow… a LOT of recipes for cuts we have never tried before. Some were hits, some were misses, but trying something new is always a good thing IMO. Now that is a beautiful sight!! My kinda picture! I have meat envy! 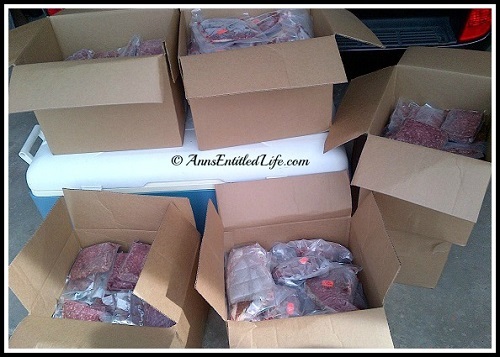 😉 I did buy about 40-50# of grass fed meat from my CSA when they were doing an “extras” run over the winter.. I’d really like to buy at least a quarter one of these days.. That averages to about 125-150ish pounds which is a lot of beef for 2 people. I just cooked a roast a few days ago that was grass-fed and it was quite yummy and really easy.. The recipe said to add a few pats of butter on the top to give it some fat, then sprinkle dry Ranch dressing packet on it, and add a jar of pepperoncini.. I only had jarred jalapenos & they were AWESOME! Stuck it in the crockpot & hours later it was fall apart amazing! Yeah this filled a good third to half our chest freezer when you take in all the dividers… as you said, a lot of meat for two people, so we are set for quite some time. We are getting a 1/4 of a cow this summer. It is being raised by the parents of a neighbor right now. They gave us some cuts from one they got last fall. I was very surprised at how lean the ground is but the roasts and steaks seem well marbled. In any case, all of it tastes just great and it is great knowing how and where it was raised. I love how they packaged yours, very nice! We too were surprised with our first cow just how very lean the all natural beef is! For most cuts, that is fine but for the chuck roast, I wouldn’t have minded a bit of marbling. We bought 1/2 of a cow late summer/early fall and are already out! We couldn’t believe it. We never ate that much beef but it was so lean and had such a good flavor our family of 5 ate through it like nothing. We called the butcher (Silver Creek Area) and thankfully he had a cow coming in that wasn’t sold yet. It should be ready anytime. We are also talking about a pig. We haven’t gotten a price yet and have never bought one but I’m sure we’ll be pleased. Anyway…I REALLY WANT CHICKEN!!! Were in WNY can I get a good price on chicken? After watching a video on Chicken Farms (You must look up on YouTube)I would really love to make the switch to local free range. Marie while not exactly inexpensive, Wendel’s Poultry Farm in East Concord is very good. If you are down in Silver Creek, that is pretty darned close. They are barn floor raised, not free range though. There are no growth stimulants or hormones added or any animal byproducts in the feed. You can also check local harvest. Just type in chicken and your area, and you will get a few pages of returns. Katie you will need to read the article on how to locate, what to pay, how to prepare, etc. Juanita, you can buy half a cow from any local farmer that sells them – click here. When you buy, know that you are purchasing by “hanging weight” which will be about 30% higher than the meat you actually receive. The farmer will talk to you about what you prefer – roasts, steaks, ground beef, etc. and in what quantity (for instance we take as many roasts as we can get, leaving us with less steaks). Depending on the butcher, you may get butcher paper or cryovac. Our farmer actually goes to PA instead of a NYS butcher because that is the closest cryovac butcher. 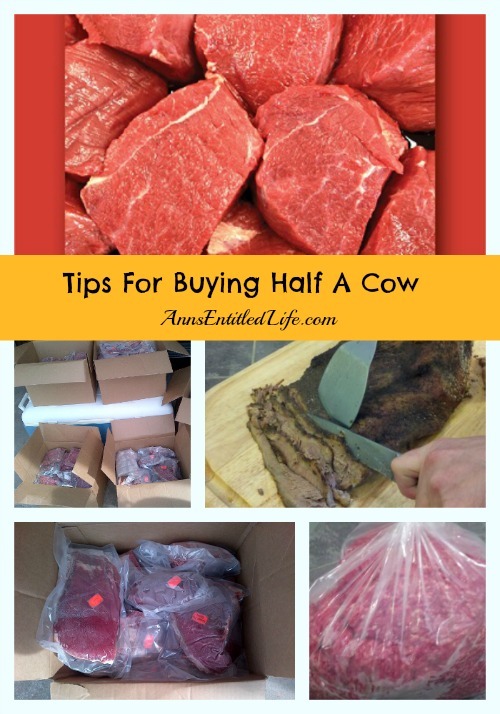 Make sure you find out exactly what type of beef you are getting, what time of the year it is available (we are getting a half of cow this week which is unusual – usually we do it in the fall). Ask for the lead time on delivery. Usually it is 1-2 months. I bought half a cow, and paid 10.79 a pound for roasts, kc strips and rib eyes and 2 lbs of filet. And 4.00 a pound for hamburger. I paid 1150.00 this better taste like gold! WOW! I can’t believe they charged you two different prices for the meats. You should have paid one price based on hanging weight. That makes the hamburger expensive and the prime rib cheap (it evens out in the end).